Adapted from a handout given to first-timers at southern California two-meter international-style foxhunts. This information is primarily for the Amateur Radio two-meter band. For 80-meter band ARDF equipment, read "Try ARDF on 80 Meters" at this Homing In site. There is no "standard" two-meter RDF setup for on-foot use by hams in the USA. Every ham who is experienced at it has his or her own idea of what works best in a given situation. Try the various methods described below and see which ones you like most. If you are a typical ham radio operator, all you need to get started quickly and find foxes successfully is your VHF/UHF handi-talkie (HT) or scanner and some simple accessories. The most elementary way is called the "body fade" or "body shield" technique. Hold your HT tight against your chest and turn around slowly, looking for the direction at which your body blocks the signal most effectively (the signal null). At this point, the signal is coming from behind you. Walk in the direction of the null, taking bearings at regular intervals, and observe the signal strength get stronger. When the signal is so strong that you can't find the null, tune 5 or 10 KHz off frequency to put the signal into the skirts of the receiver's IF passband. If your hand-held is dual-band (144/440 MHz) and you are hunting on two meters, try tuning to the much weaker third harmonic of the signal in the 70 cm band while performing the "body shield." Disconnecting the HT's "rubber duck" antenna will knock down the signal even more. Hearing the signal with antenna off is usually a "You are here!" indicator. 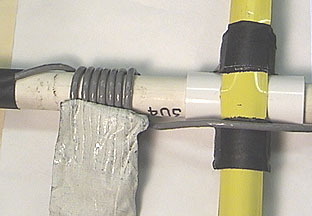 Some foxtailers wrap aluminum foil around their HTs to attenuate the signal even more. If you do this, be sure to put insulating tape over the battery charging terminals on the bottom of the set first. You might damage the radio by shorting these terminals with the foil. The "body fade" null, which is rather shallow to begin with, can be filled in by signal reflections (multipath), nearby objects, etc. When using this method, stay away from large buildings, chain-link fences, metal signs, and the like. If you do not get a good null, move to a clearer location and try again. You'll get much more accurate bearings, plus more sensitivity when hunting weak signals, if you use an antenna with forward gain and directivity such as a yagi, cubical quad, or phased array. The technique is simple, just point the antenna toward the horizon and turn your body in a 360-degree circle to find the direction in which the signal is strongest, just as if you were turning a rooftop TV antenna for best picture. When signal strength is greatest, the high-gain antenna is "pointing" toward the signal source. You could remove and carry the 4-element yagi or quad that you normally use for mobile T-hunting, but it's rather large and cumbersome. You don't need that much gain and pattern sharpness --- two or three elements will do nicely. A good ready-to-hunt choice for two meters is the 3-element yagi by Bob Miller Enterprises (above right). Element rods fold along the boom for easy storage and transit. Each antenna is hand-built and tuned for best match by N6ZHZ. For close-in "sniffing," consider the Shrunken Quad on pages 173-176 of the book Transmitter Hunting--Radio Direction Finding Simplified (THRDFS). It is more compact than a yagi or phased array and is safer because it does not have long pointed elements. It is somewhat tricky to tune and has a narrow bandwidth (about 500 KHz), but it is an excellent choice if most of your hunts are on one frequency such as the southern California coordinated transmitter hunt frequency (146.565 MHz). 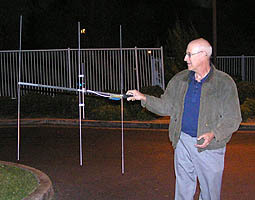 Today's favorite home-built two-meter radio-orienteering beam among newcomers is the 3-element yagi documented at WB2HOL's Web site. 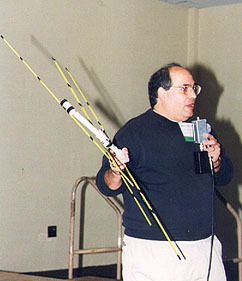 The photo at right shows Joe Leggio WB2HOL demonstrating this antenna at the Dayton Hamvention. It's a simple project made from a steel measuring tape, PVC pipe, hose clamps, and a "hairpin" match to the coax. The steel tape measure elements fold gracefully for convenience and safety as you crash through the brush at running speed. You can build this antenna from scratch using parts from your local hardware store, or get an inexpensive kit from Marvin Johnston KE6HTS. Some mechanical construction improvements and storage tips by David Deane G3ZOI are here. The biggest problem with two-meter RDF yagis is how to hold onto them while beating the bushes for hidden transmitters. 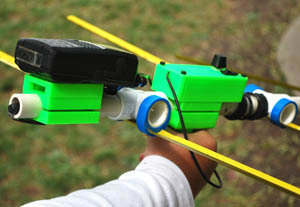 Grasping the middle of the boom is awkward and it introduces body capacitance that may affect antenna performance. Using the extension of the boom behind the reflector as a grip solves the hand-in-the-antenna problem, but it is even more awkward because the entire antenna pulls the hand down at the wrist. Most pre-teens cannot hold an antenna this way for more than a minute. A handle at the balance point of the boom keeps body parts out of the field of the beam and eliminates torque on the wrist. Julianne Walsh, KI6DYX and her husband Peter manufacture a clever plastic handle assembly that clamps to the boom of your measuring-tape yagi. Atop the handle is a compartment that is just the right size to hold an offset attenuator circuit board. They also make plastic rings that hold the elements securely in place to the boom, as well as a plastic platform to secure a handi-talkie or scanner behind the reflector by its belt clip. Several bright colors are available, as shown in the photo at right. These parts are available for sale from Marvin Johnston KE6HTS. At the start point, you can usually use your handi-talkie's S-meter to take bearings with your RDF antenna. When you get so close that the S-meter goes off scale, you will need to reduce (attenuate) the signal into the receiver. Simple resistive RF attenuators that are commonly used for mobile hunting are of limited use, because the signal will bypass the attenuator and and go through the receiver case by the time you have put in a few attenuation steps. To reduce direct pickup by the receiver, you can try aluminum foil shielding, as described above. If you have a dual-band hand-held, you get will the equivalent of 40 to 60 dB attenuation by tuning it to the third harmonic of the hunt frequency. A small UHF yagi or quad will give sharp bearings on the hidden T's third harmonic when you are within a few dozen feet. The favorite signal reduction device of on-foot foxhunters with beams is an "active," or "offset" attenuator. It converts a strong on-frequency signal into a weaker off-frequency signal, usually from 1 MHz to 5 MHz up or down the dial. To use it, tune your receiver to the offset signal, then adjust the attenuator for the needed attenuation, from 20 dB to 100 dB or more. Signal leakage into the receiver case is not a problem with this kind of attenuator. The original active attenuator by Eenhoorn, described in QST Magazine for November 1992 and ARRL Handbooks in the mid 1990s, used an RC-oscillator. A more modern crystal-controlled circuit (see photo at left) is fully described in this Homing In Web site. (Build an Offset Attenuator) You might find everything you need for this home building project at your local electronics parts store for about $15, or you can buy a pre-assembled circuit board from Marvin Johnston KE6HTS. Marvin also sells a complete kit of the enclosed attenuator inside the boom of a measuring-tape yagi. You might think that all competitors in an international foxhunting championship should be required to use the same type of receiving equipment and that all sets should give identical performance. But that's not practical. Equipment preferences and availability vary greatly from country to country. The IARU rules for championships instruct all entrants to bring their own gear. Any type of RDF set is allowed, so long as it can be carried by the contestant and does not radiate any signals that would interfere with the hunt. It's possible to do very well in multi-nation ARDF events with your HT or scanner, beam, and offset attenuator as described above. But the majority of experienced radio-orienteers eventually opt for a lightweight one-piece receiver/antenna set with added features such as tone-pitch signal-strength indicator. No such sets are commercially manufactured in the USA at this time, but they are available from foreign sources in kit or wired/tested form. The most popular one-piece set among ARDF Team USA members is the frequency-synthesized Sniffer 4 from Bryan Ackerly VK3YNG in Australia (photo at left). It covers both the full two-meter band and the 120-123 MHz aircraft band with selectable AM, FM or audio S-meter tone output to the loudspeaker. You can listen to both the receiver audio and S-meter tone at the same time with stereo earphones. It includes automatic-ranging attenuation in 15 dB steps. For multiple-frequency hunts, there are six programmable memories. 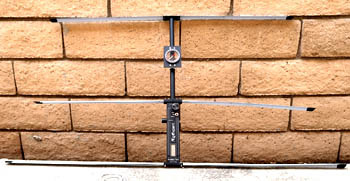 Sniffer 4 is lightweight and easily attached to the RGE VHF-144 antenna (see below) or a home-built measuring-tape beam. Cost with shipping to the USA is just over US$200. A detailed product review by KØOV is in Homing In for Fall 2007 issue of CQ-VHF Magazine. 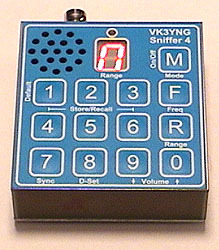 Sniffer4 is available directly from Bryan Ackerly in Australia and is also sold by Bob Miller Enterprises in California. The new FoxRex144 from RigExpert in Ukraine (at right) is a full-featured AM receiver and measuring-tape yagi with attached compass. The receiver, designed by Nick Roethe DF1FO, has 12 frequency memories and built-in timers for five-fox classic and other ARDF events such as foxoring. A built-in lithium battery with charger provides power. This plug-and-play set covers 144-146 MHz as shipped, but can be changed to 144-148 MHz in the Settings menu. It sells for approximately $470 and is available from suppliers in the USA, including DX Engineering. A review of this unit is scheduled for my Homing In column in CQ Magazine for May 2019.
International rules for ARDF championships call for amplitude-modulated (AM) transmitters on two meters, but in the USA frequency modulation (FM) is more popular for informal local events. The single-conversion FoxRex-144 has relatively wide 10.7 MHz IF stages with shallow slopes, so FM signals can be copied by "slope detection." FM signals appear somewhat noisy because there is no "quieting" as would be the case with an FM detector. Many foxhunters in former Soviet Union countries still use 80's-vintage RDF sets made at the Barnaul Radio Factory in southern Siberia. The Russian Altai-145 is a complete two-meter receiver/antenna unit in one piece. The AM receiver is built into the boom of a 3-element yagi. The foxhunter holds it overhead and orients the yagi for loudest signal in the earphones. For safety in the woods, the yagi elements are made of curved steel tape. The receiver is capacitor-tuned (non-synthesized). There is no FM detector or BFO, but it has a quencher circuit that interrupts the signal at an audio rate to create an audible tone in the user's headphones. Slope detection of FM signals works OK. There is no S-meter. Sensitivity is low, approximately 7 microvolts threshold. Pre-owned Altai-145's are occasionally available at "street prices" of US$80 to US$100. They were used successfully in the 1993 Friendship Radiosport Games in Victoria, Canada. However, they cover only 144-146 MHz as supplied, which is the two meter band range in IARU Regions 1 and 3. Modification to move or increase the frequency range is possible, but frequency range shifts as the 9V battery discharges. A more severe problem is the Altai's lack of sufficient IF-stage selectivity to perform reliably in the crowded band conditions of a typical US city. Stations up to 50 KHz away can cause serious QRM. Altais work much better in Russia, where two meter repeaters are less prevalent. In the Czech Republic, OK2BWN Radio Sports Equipment is selling the SuperFox145E and SuperFox 145DX sets with an HB9CV-style two-element beam and continuous tuning superheterodyne receiver with Ni-Cd rechargeable battery. Note that these receivers tunes only 144-146 MHz and have 100 KHz IF bandwidth, so their usefulness may be limited in the USA for the same reasons as for the Altai-145. From the United Kingdom, the ROX-2T receiver project (photo at left) by David Deane G3ZOI has varactor tuning and AM detection, ideal for European/Asian 2m hunts. The simple circuit uses an TA7613AP AM receiver chip and two other ICs. Plans are on the Web. Kits or assembled units may be available from time to time; contact David directly for information. In China, The PJ-2B foxhunt receiver/antenna unit is made by the Zhengzhou Tianxun Radio Research Institute (CZTXARDF). It are not marketed in the USA at this time. An importer is being sought. The sensitivity of your two-meter ARDF equipment should be about the same as that of a handie-talkie. In an international championship foxhunt, the first transmitter will be at least 3/4 of a kilometer from the starting point, running as little as 250 milliwatts. Tuned or untuned field strength meters (such as the Sniff-Amp on pages 173-176 of THRDFS) and commercial "bug detectors" do not have sufficient sensitivity to hunt at this distance. However, such low-sensitivity units can be helpful when you are a few yards away from a well-concealed transmitter and you can't get enough attenuation with your sensitive equipment. The 1980s-vintage Little L-Per dual-pattern RDF set by L-Tronics is still popular with search and rescue teams that hunt Emergency Locator Transmitters in the wilderness. It consists of a dual-dipole antenna set, switcher, and receiver with attenuator and zero-center meter. It has two modes for RDF. The switched mode gives a very sharp left-right indication on the meter, making it easy for the user to walk the bearing line toward the transmitter. In the non-switched mode, the antenna performs like a two-element phased array and the meter reads signal strength; this is better for very weak signals. The sharpness of the zero crossing indication in the switched mode makes possible more precise bearings than those obtainable with a quad or yagi. Under ideal field conditions, bearing accuracy is within one degree. Meter deflection tells the user which way to turn to zero the meter. For example, a negative (left) reading requires turning the antenna left. This solves the 180 degree ambiguity caused by the two zero crossings in each complete rotation of the antenna system. The original L-Per is no longer made, but pre-owned units can be found. It has 4 receive channels, with a crystal required for each. That limits its versatility on ham bands. Plans for the Happy Flyer DF, a similar dual-pattern design, are on pages 106-113 of THRDFS. This homebrew unit can be added to most VHF receiver models with a little minor electronic surgery. Both the L-Per and Happy Flyers units have RF gain controls that can be used to gauge relative distance to the fox. A new frequency-agile version of the L-Per went on sale in January 2006, covering the entire 120 MHz aviation band as well as the 2m and 125cm ham bands. Dual-antenna add-on sets give sharp left-right indications similar to the L-Per, but they can be used with ordinary narrowband FM hand-helds and scanners over a wide frequency range. The RDF set plugs into the antenna and earphone connectors of the receiver; no modification of the receiver is required. These "phase-front detector" sets use the time-difference-of-arrival (TDOA) principle, which ignores amplitude variations in the signal. No attenuator is needed with them. Vector-Finder by National RF, Incorporated, reviewed in Homing In for July 1996. Foxhound by Ramsey Electronics. Be sure to read Design Problems and Fixes for Ramsey RDF Equipment at this site. Simple Seeker by David Geiser W5IXM, fully described in the ARRL Antenna Compendium, Volume III and ARRL Handbook, 1995 and later Editions. Foxhunt Radio Direction Finder by Paul Bohrer W9DUU, fully described in 73 Amateur Radio Today, July 1990. Circuit boards are available from FAR Circuits. The SuperDF by BMG Engineering is no longer made, but you might find a pre-owned unit. The above sets all use left/right LED indicators or a zero-center meter to show deviation of the signal from the bearing line. By contrast, the Handy Tracker by Joe Moell KØOV is a simple TDOA set with two audible null patterns to resolve the front/back ambiguity, instead of LEDs or a meter. It uses only one IC and has a smaller antenna pair than the others. Complete plans were in 73 Amateur Radio Today Magazine, September and November 1989. Add-ons which provide only a tone null indicating the front/back bearing line, but do not resolve the 180-degree ambiguity, are also available. These sets are not recommended for radio-orienteering because they give you a 50/50 chance of going the wrong direction. However, there are modifications to improve their performance. For details, see "Sense The Right Way To Go With The HANDI-Finder®" in this Homing In site. Objects near the observer such as concrete/steel buildings, power lines, and chain-link fences will distort the incoming TDOA wavefront and give directional errors. Even a dense grove of trees can have an adverse effect. It is always best to take your bearings in locations which are as open and clear as possible, and to take them from numerous positions for confirmation. Keep checking as you move along to "eyeball average" the readings. Some TDOA RDF sets have a slow-response mode that aids the averaging process. Because most TDOA sets use relative phase information only and pay no attention to signal level, they make it difficult to gauge distance to the signal source. It is not uncommon to see a TDOA-using foxhunter walk over the top of a concealed transmitter and walk away, following the opposite 180 degree null, because there is no indication of "You are here!" signal strength. To avoid being fooled, keep moving and take bearings very frequently, verifying that you are still approaching by carefully observing the left/right indication. 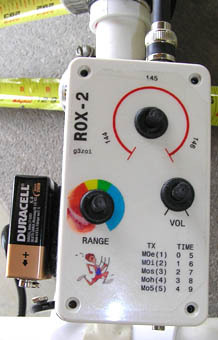 TDOA sets were were plagued by cross-modulation from out-of-band signals when used with extended-range hand-helds in the 1991 Portland Friendship Games foxhunt. This can be a serious problem if there are strong VHF-FM transmitters nearby and the receiver's front end has very broad response. The solution in this case was to use only handi-talkies with narrow-range front ends, such as the Icom IC-2AT, Tempo S1 and Radio Shack HTX-202. Switched-pattern and TDOA sets have vertical antenna elements. They may not perform well if the fox transmitters are horizontally polarized, depending on multipath conditions at the site. IARU ARDF rules call for fox antennas to be horizontal, and all are that way in Europe and Asia. But many clubs in the USA choose to use vertical whips on foxboxes for local hunts. It should be noted that experienced European foxhunters claim that DFing vertically polarized signals in the woods is much more difficult than DFing horizontal signals, because signal reflections are more prominent with vertical polarization.